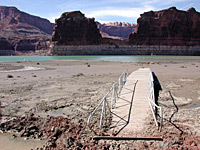 Stranded ramp at Hite Marina on Lake Powell. Why was Glen Canyon Dam Built? What lies under "Lake Powell"? What about the recreation economy?